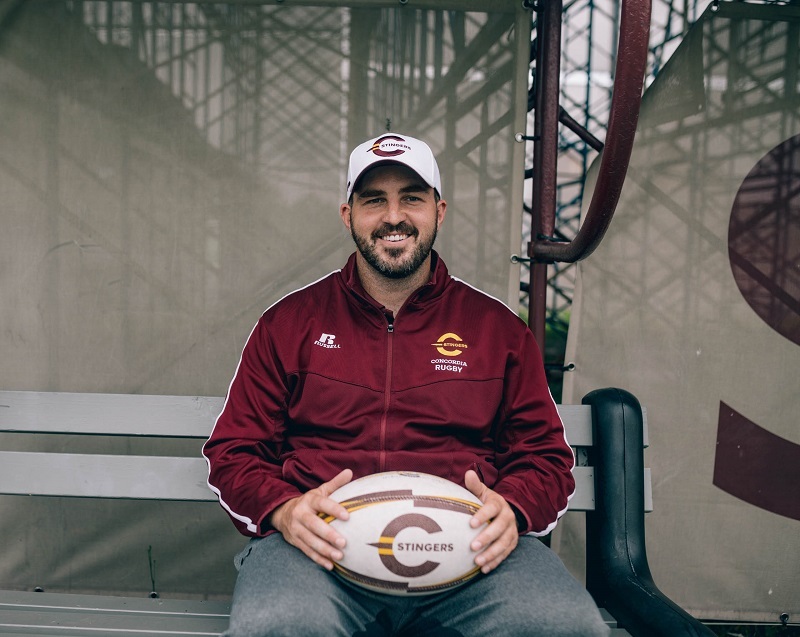 The 2016 season was a difficult one for the Concordia Stingers men’s rugby team. They finished the season with just one win and seven losses. Craig Beemer had been hired as the head coach just weeks before the start of last season and faced a lot of challenges in his first year. Heading into the 2017 season, which started with a 34-10 away win against the McGill Redmen on Sept. 10, the head coach said his team has learned from their previous season. “When you have a tough year record-wise, it shows your character and really makes you reflect,” he said. Last year, Beemer had no time to recruit or prepare for the season. Although he was a head coach at McGill for eight seasons and an assistant coach with the Stingers for two seasons, he had never been thrown into the fire so fast. The Concordia Stingers engage in a scrum in a regular-season game during the 2016 season. Archive photo by Brianna Thicke. In the off-season, Beemer had a lot of time to reflect on the 2016 season and prepare for the upcoming season. He also added three new recruits to his roster: fly-halfs Sam Montminy and Jean-Christophe Vinette and second row player Adreano Alacchi. Montminy is the highlight of the trio. Beemer said he was a starter for St-Anne’s Rugby Football Club when they won the Quebec Rugby championship—the highest-ranking rugby competition in the province—in 2016. Vinette has only been playing rugby for two years and made the team during tryouts. Alacchi, who started playing rugby at Loyola High School, played with the Quebec U18 team in 2015 and 2016. Beemer had high praise for Alacchi, who measures in at six-foot-five. “He may not be a superstar now, but he will be in the future,” Beemer said. The rookies will complement a team with many players who were in their shoes a year ago. The Stingers had 13 rookies on the 30-man roster last season, but the head coach said having his group grow together will only make the team stronger. “A lot of the rookies from last year played rugby this summer, got into the gym, and they look like completely different players, in a good way,” Beemer added. Another crucial aspect of the Stingers development is the return of four key players. Fourth-year fly-half Moritz Wittmann and second-year winger Daniel Pelletier-Ragguette are returning from knee injuries, while third-year centre Charles Debove also returns from an injury. Flanker Lucas Hotton, who was a rookie on the team during the 2014 season but didn’t play in 2015 and 2016, is rejoining the Stingers this season. After a long off-season of recruiting and training, Beemer said he sees a bright future ahead of his team.